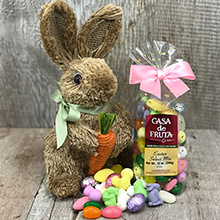 Easter Select Mix is a fun assortment of milk chocolate foil eggs, holland mints, jelly beans, and jelly easter shapes. Packaged in a 12 oz. gift bag. Rabbit not included.